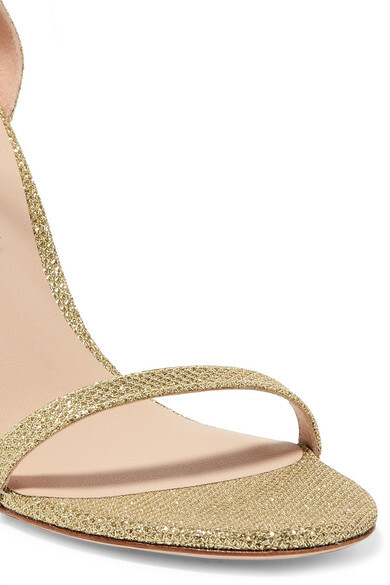 Stuart Weitzman's ‘NudistSong’ sandals are one of the brand's most popular styles and for good reason - the slender straps frame the foot so beautifully. This pair is constructed from gold lamé with a subtle shimmer and fitted with adjustable buckle fastenings at the ankle. The manageable 90mm heels and lightly padded insoles make them a comfortable choice for events where you'll be doing more standing than sitting. Shown here with: Michael Lo Sordo Dress, Paco Rabanne Shoulder Bag, Kenneth Jay Lane Earrings.